There are many books about business ownership, management, leadership, and other worthwhile topics business owners might find interesting. We read these books (you know the ones - the New York Times bestsellers) and we hope to apply 1% of the content for 100% of the effort. These books have their place in the libraries of business owners. You read them, you get motivated, and you hope that the content applies to your business in some way. In thinking about how to best describe Toilet Paper Entrepreneur I thought it would be best to describe what the book is not and what you won't find in it. It's not filled with concepts practiced by management consultants at Fortune 100 companies, it doesn't have fancy matrices, and it doesn't have scientifically proven results from focus groups. It is not published by a business school and it doesn't have a renowned professor and large company CEO quotes on the back cover. If you have been a business owner for many years it won't tell you how to get to "the next level". Much more exciting is what it does have, and in a nutshell, it speaks to the people who are working for a company or are in college but deep down inside they want to start their first business. You know who you are - the cubicle dweller (or midnight study mole in college) who has an idea and thinks about it, talks about it with friends and family, but at the end of the day goes to bed and to work (or school) the next day. anyone who wants to start a business with limited resources can do so. It's a "bottom line" book to starting a business on a shoestring, which the author supports wholeheartedly. Those of you who are waiting to take the plunge will gain some benefit in reading about real life examples and experiences of real people starting and running businesses. The book distills these experiences in often humorous way and provides insight into real trials and tribulations of small business owners. Readers will be interested in learning about the author's own successes and failures in the forward section of the book entitled "My Three-Sheet Story". business will find value in a book that offers direct, no-nonsense approach from experience and will hopefully persuade those who want to start their business to, well, "Just Do It!". 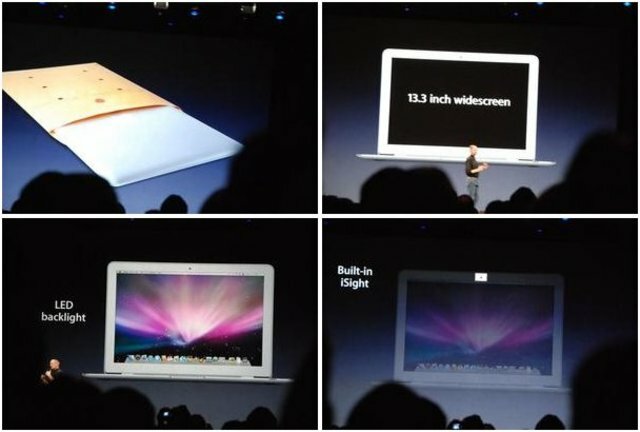 (Photos from MacRumorsLive.com) - Yes, Apple is releasing an ultra-thin laptop called MacBook Air. Thinner than thin! $1,799 gets you the thinnest notebook ever with a 13.3in screen, 80 gb hard drive, and 5 hours of battery life. Also announced a price drop in the not-so-popular Apple TV (down to $229). And Apple is now in the move rental business - you will be able to watch rented movies on the iphone. I'll never understand why with the vast resources of Dell, HP, Lenovo, Toshiba, and others why these companies can never out-design Apple. Now I have another reason to go to the Apple store!